It is the hiring process done on the basis of referral or a candidate referred by an employee of the organization. Though the employee referral program might sound like a new concept, it is quite an old way of recruiting the best fit for the position. The degree of success varied to a large extent and sometimes it took a long time to fill up the positions, whereas there were times when the whole recruitment process was completed within a matter of time. 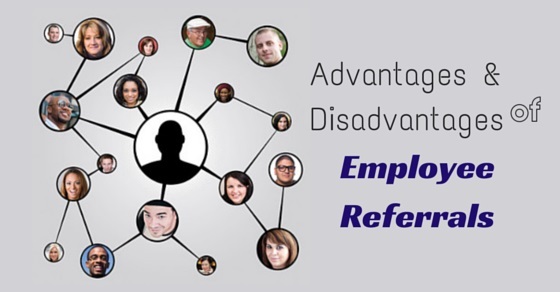 Everything has its own pros and cons and employee referral scheme is no different. There are companies where you will find that the employee referral program is not that popular and in some places, the hiring is totally dependent on the employee referrals. If your employee referral program is under appreciated, then you must take serious consideration to enhance it a bit and in case it heavily relies on the employee referral program, then you must take into consideration, the pros and cons of the employee referrals. In the recruitment and selection process, an employee referral program plays a very important role. Though this program comes with its own advantages and disadvantages, it is still one of the popular way of hiring employees. It gives the employees an opportunity to get their friends and known resources to join the company, in a way helping their people and the organization both. It is also advantageous to the organization, as they can avoid the extra burden of advertising and shortlisting candidates. This helps them to decrease the load of the whole recruiting process. How Employee Referral Program Works? The employee referral program is an informal way of asking your employees to fill up the vacant position with someone they know who is qualified enough for the job. Usually, when you ask someone to dig in deep to see whether they can find a suitable candidate for the job, then most likely they wouldn’t put in much of an effort. But, if you add some job referral service rewards for high-quality candidates, then the employees will take the pain to figure out the right kind of candidates. You must explain the various benefits they will be enjoying if they refer the right candidates. This will ensure that you get the right mix and don’t waste your valuable time in sifting the weak candidates. When you are providing the employees with some benefits, whether it is cash or goods, then they will take the onus on themselves to acquire that. In order to add that extra money to their wallet, they will screen the profile of the candidate well, so that their candidates get selected and they make money at the end. Through referral programs that work you can create a pool of candidates who are best suited for the job. The quality of the candidate is always high when you are seeking candidates through employee referrals. One of the reasons behind this is that the initial screening is already done by the current employee and as his reputation will be at stake, therefore, he will only be selecting the candidates who will be able to deliver. If the employee keeps on referring poor quality candidates, then it shows that he or she doesn’t have much of a judgment power. It might also affect his own career as well, so he would definitely avoid referring to someone who is not fit for the job. The monetary bonus that the company offers is a great way of encouraging the employee referral method and it also helps the company get the best fit for the vacant position. It obviously works as a morale booster and the employees try to refer only the best candidate. If you have outsourced the methods of recruitment because of the complications involved in it, then you can rely on the employee referral program to simplify the matter. The cost will also be reduced in the referral recruitment methods. When you are using an employee referral program, then you will save a huge fortune on advertising, job fairs, employment agencies, etc. Initial screening is done by the employees only, so you can save your valuable time as well. The retention rate in case of employee referral program policy is much higher as compared to other sources. It is mainly due to the reason that the new employee is already familiar with the environment and it won’t take much time or effort on his behalf to absorb the culture of your company as he already knows someone from the company. When you are hiring someone through reference, then the workforce cannot be termed as even playing turf anymore. Most likely they will hang-in together, thus raising the risk of getting alienated from other team members. If your company is heavily dependent on the employee referral program, then you might face the charges of discrimination from the candidates who have been rejected. It might happen that the employee referral program brings in the attitude of stick together, which will hide the organizational problems and in turn increase it. Even the growth of referral program ideas will also stop and a stagnant stage might appear. When you have strict guidelines for the bonus that will be paid out for the referrals, then the employees might get disillusioned about the whole process, which will, in turn, lead to the discontent of the employees. If you want to make the most out of this employee referral program, then you must take into consideration the disadvantages of the process as well and work accordingly. Do not depend on the employee referral program entirely; instead, make use of the best recruitment strategies other sources as well.